The two-day training workshop on Trenchless Technologies for Urban Projects, organized by Asian Development Bank (ADB) in collaboration with Indian Society for Trenchless Technology (IndSTT) at the ADB Training Center, INRAM 2, Taj Palace Hotel, Chanakyapuri, New Delhi 110021, was conducted successfully on 9th & 10th August 2011. 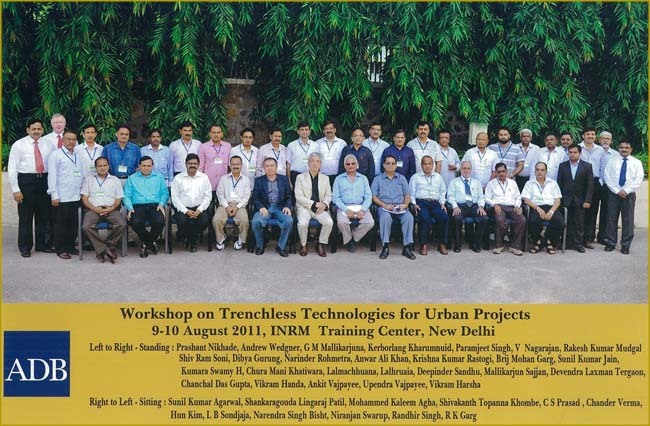 The programme also included release of No Dig India Journal (NDI), August 2011 issue, and Second editions of Standard General Conditions for Construction Contracts Employing Trenchless Technology (GCC), and the Guidelines for Application of Special Conditions of Contracts Employing Trenchless Technology (SCC). In addition the Workshop CD was also released during the inaugural session. The workshop included the training sessions and live demonstration of trenchless equipment. 11. SOP Manual for Application of Trenchless Technology in developing and maintaining subsurface utility networks under PWD roads in New Delhi. Other interested stakeholders can request for copies from IndSTT office. Details of various workshop sessions are as follows. Welcome address of the workshop was delivered by Mr. Hun Kim, Country Director, ADB. In his address, Mr. Kim welcomed the participants coming from across the nation and explained the ADB policy towards application of new technologies in bank's projects. The show's inaugural address was delivered by Mr. Chander Verma, Chairman IndSTT wherein Mr. Verma explained the workshop structure. In the later part of his address Mr. Verma discussed the PWD Standard Operating Procedure (SoP) for a safe and accident free trenchless activities and urged the participants to consider applying the SoP in their project related activities. Finally the key note address was delivered by Er. C.S. Prasad, Vice Chairman IndSTT and DG, CPWD. Er. Prasad highlighted the importance of Trenchless Technology in construction activities and his experience of their effectiveness in CPWD project executed. He also explained the importance of contract formation process for trenchless projects and explained the need of specific contract conditions for trenchless. After the addresses SCC, NDI, GCC, and CD were released by Mr. Kim, Mr. Verma, Er. Prasad, and Mr. Sondjaja respectively. After the inaugural session, four technical sessions were conducted on the first day. In the first session, Prof. Niranjan Swarup, Executive Director IndSTT, delivered the presentation entitled ‘Basics of Trenchless Technology Techniques’. In his presentation Prof. Swarup presented detailed account of the different trenchless technology methods and their applicability in development, maintenance & management of subsurface networks without excavation of continuous open cut trenches. During the presentation he also emphasized that successful completion of a Trenchless excavation or rehabilitation or replacement project requires a clear understanding of the underground / subsurface conditions and the selection of equipment used for the specific conditions of the project. The second session entitled 'Subsurface Utility Engineering and Geotechnical Techniques', was presented by Dr. Sanjay Rana, Director, Parsan Overseas (P) Limited. Topics covered by Dr. Rana, included elaborated account of the various geophysical techniques, like ground penetrating radar, seismic refraction, electrical tomography and seismic reflection, used to provide detailed and quick assessment of subsurface conditions in non-destructive manner to eliminate surprises during project execution. Dr. Rana also demonstrated the Ground Penetration Radar (GPR) techniques and displayed the equipment used in the survey. Next session entitled 'Technology Selection Process and Technique Specifications' had two presentations, delivered by Prof. Niranjan Swarup and Mr. Andrew R Wedgner, application Marketing Manager, BU Pipe, Borouge, UAE respectively. Prof. Swarup made a presentation on the process of selecting appropriate trenchless technique suiting various project requirements. In the second part of the session Mr. Wedgner described the properties of polyethylene and its utility and applicability in Trenchless Technology projects. He also explained the selection of appropriate trenchless techniques based on the pipe quality. The last session of the day entitled 'Pipeline Condition Assessment Techniques' also had two presentations, delivered by Prof. Niranjan Swarup and Mr. Ankit Vajpayee, CEO and MD, Russell Technology India Pvt. Ltd. respectively. In his presentation, Prof. Swarup explained the pipeline performance requirements, types of defects and failure due to the defects in buried pipelines and methods of condition assessment, both direct as well as indirect. Mr. Vajpayee presented on various Direct Pipeline Condition Assessment methods. Mr. Vajpayee also elaborated the condition assessment methods employing electromagnetic sensors for in-line inspection of pipelines through Magnetic flux leakage tools and remote field technology. In the first session of the second day, the presentation entitled 'Guidelines to Establish Contract Conditions for Design and Construction by Trenchless Techniques' was delivered by Prof. Niranjan Swarup, with Dr. S.K. Ahmad, Coordinator, CIDC in attendance. During presentation Prof. Swarup illustrated the step of trenchless procurement process, elaborated trenchless project planning and design considerations, discussed various requirements of trenchless construction contracts and highlighted the need for the special condition of the contract for the trenchless projects. The next session comprised presentation entitled 'Trenchless Project Execution Guidelines' by Mr. Anand Dwarkanath, Herrenknecht (Asia) Ltd. Starting with short introduction of various Microtunneling machines, Drilling rigs and EPB machines the presentation dealt with the working process of the Microtunneling, HDD & Auger Boring methods, their main components, the range of applicability and selection criteria for these methods, and the advantages of each method over others. Mr. Dwarkanath also gave detailed account of the different major projects executed using these methods in India. His presentation was supported by IndSTT presentation on the topic whereby the participants were made aware about various nuances of project execution guidelines. Use of SoP provisions to safeguard the existing buried structures and overlaying road structures were also suggested through IndSTT Presentation made by Prof. Swarup. Mr. V. Nagarajan, Chief Executive Officer, Tanya Associates, delivered third presentation of the day entitled 'Trenchless Project Economics & Cost Comparison with Conventional Construction Techniques'. Mr. Nagarajan in his presentation described in detail the advantages of the trenchless methods over conventional open-cut trenching methods for new installations as well as rehabilitation and replacement of the subsurface utilities. Through one of the case stories presented he also explained that the Trenchless Technology was significantly cheaper and more socially acceptable method of construction when compared to open-cut methods in one of his projects in Mumbai. Prof. Niranjan Swarup, during this presentation, further elaborated in great detail the benefits, economics and social impacts of the trenchless projects and gave comparative account of the trenchless project and the conventional open-cut construction techniques. In the last session of the day, the presentation entitled 'Trenchless Project Supervision & Conclusion Guidelines' was made by Mr. Sunir Garg, Director, Gypsum Structural India Pvt. Ltd. Mr.Garg made presentation on a river crossing for Numaligarh-Silliguri Pipeline executed by them in a difficult terrain by Microtunneling. In addition Mr. Garg also explained about the pipe bursting project executed by him in Mumbai. IndSTT presentation of the session provided elaborate guidelines about project supervision and conclusion activities and the role of SoP in those. In the last session, which was coordinated by Prof. Swarup, participants posed their questions and sought clarifications on their doubts. In addition participants discussed their project related issues and sought inputs on the ways to apply trenchless to overcome those. Through intense interactive discussions these issues were discussed and possible ways ahead were suggested to the participants. Participants indicated that they would use trenchless technology wherever open-cut construction methods were unable to provide cost/time effective solutions. The training programme concluded with the distribution of certificates to the participants by Mr. L. Sondjaja, Head PMU, ADB.